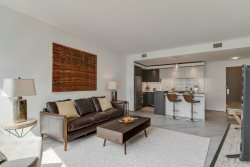 Dwel @ Latitude is our newest collaboration with the most anticipated apartment building of 2016, right in the heart of Arlington, across from the Virginia Square metro station. Latitude was designed with the lifestyle of its residents in mind, from a dog spa to a rooftop living area, it has your interests and needs covered from morning 'til night. As the exclusive serviced apartment residence provider at Latitude, Dwel will offer its 'standard' of functional yet luxuriously tailored apartments. Do you hang out in Clarendon? Shop or work in Ballston? Spend time in DC? Do you want to live at a place where all of that is easy to reach? Then Virginia Square is where you should look and Latitude is where you should live. Located right by the Virginia Square Metro, one stop from Clarendon, one stop from Ballston and just a short ride from DC, you can be anywhere you want in a matter of minutes. It is a level of freedom most Arlington apartments do not come close to offering. Rooftop living area with movie viewing, gaming space, bar, fire pit, lounge seating, water feature and gorgeous green-roof installation. It's pretty simple really. All we ask is that you treat this apartment and our furnishings as if you owned them and respect the building residents and staff. No Smoking Policy: All Dwel apartments are 100% non-smoking. Smoking is not allowed in the apartment to include any balconies or on the property to include common areas and garage. Violation of this policy will result in a $500 fine and could lead to possible eviction. We love pets and are pet owners ourselves; however, there is a 2 pet maximum. In some cases, there are restrictions based on weight and in almost all cases there are restrictions for aggressive breeds. Let us know what type of pet you have and we can provide all the details. Pet fees include a $500 non-refundable deposit and $3/night per pet charge. For more information, please see our FAQ’s and Terms & Conditions.